Roll Post shelving is widely used for the storage of small quantities of items that can be picked manually. Shelving can be configured either in single sided or double sided rows. 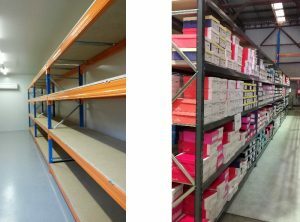 Medium Duty Roll Post shelving can be used for heavier items or two tier shelving to maximise storage where the floor area is limited but adequate ceiling height is available. Applications – Large spare parts, archive boxes, cartons, loose furniture. Long Span Shelving utilises either pallet racking for heavy duty applications or channel post frames and lightweight beams for light to medium duty applications. Long Span Shelving is supplied with either particle board, plywood, mesh or fabricated steel shelves fitted to the beams to store non-palletised items. Shelving may be configured for manual picking from ground level or several metres high for use with stock pickers for high volume storage applications. A range of Long Span Shelving bay heights, widths and depths is available with beam and column sections to suit the span and loading configuration.